You are here: Home Product Digital Home Logitech Revue at the Today Show! 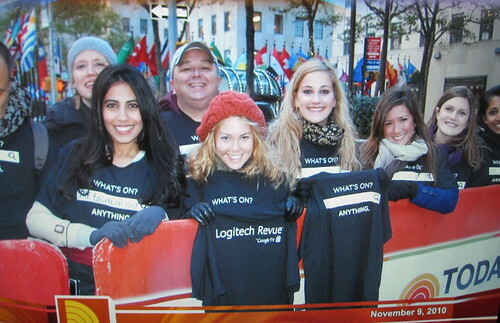 Logitech Revue at the Today Show! Posted on November 9, 2010	by Praneet Kailey	in Digital Home, Events and Culture	with 1 Comment on Logitech Revue at the Today Show! Today was no ordinary day, by any means. I ended Monday night with a great event, and despite the late night, my alarm was set for 4:30AM…why so early? We had an objective. What do you do when you have an excess amount of promotional T-shirts and you want the citizens of your city to take notice, wear them and advertise alongside you? 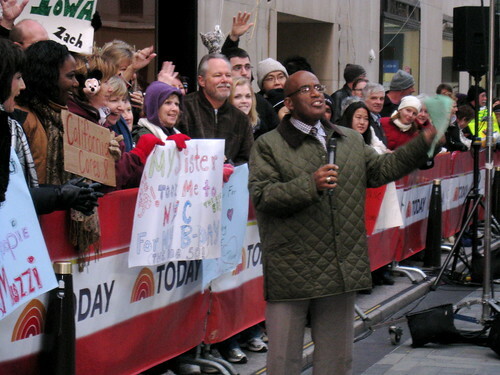 You crash the Today Show at Rockefeller Plaza! What better way to spread the Logitech word throughout the streets of NYC!? So we got a group of PR interns from Ruder Finn to come along and ‘flash mob’ the Today Show set with us. We arrived at dawn; our stash of Logitech Revue with Google TV T-shirts accompanying us in inconspicuous garbage bags, well, perhaps we were obvious (see photo!). Regardless, nobody seemed to mind our smiling faces despite the early morning cold NY winter air…not just that, we were determined to score some camera time to promote promote promote. Did we succeed? Yes indeed! Not only did our lovely team distribute hundreds of T-shirts, we got a lot of the crowd to put them on immediately, AND we even got a few into the hands of the Today Show hosts and staff themselves. As if that wasn’t exciting enough, I held a conversation one on one, one by one, with Matt Lauer, Meredith Vieira and Al Roker, explaining what the Logitech Revue with Google TV was. They loved it! We were a hit! 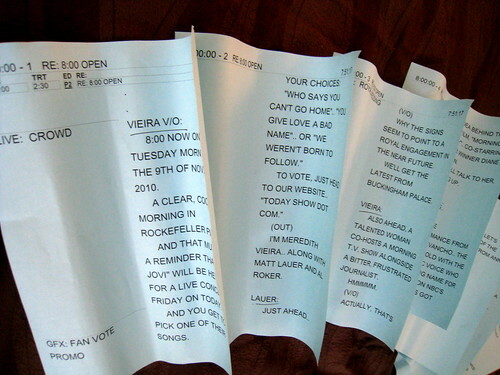 Matt Lauer’s producer even approached me after the camera’s stopped rolling to award me the original script from that mornings show. He told me that I deserved it as Matt spent the most time speaking with me and even stopped to take a photo. Thanks Matt and Matt’s producer! We can’t wait to get some Revue boxes over to your offices at NBC! Overall, this morning was a very, very cool experience! Check out all our great photos! Our secret stash of T-shirts and our 5AM team! 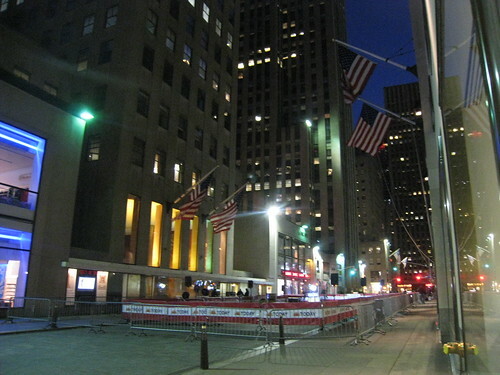 The quiet Today Show set in the wee hours of the morning…we were among the first to arrive. Just one of our many spirited crowd members willing to wear our T-shirts to help us show the Today show just who we were! Power in numbers! Anyone want to guess how many layers of clothing we have on at this point? 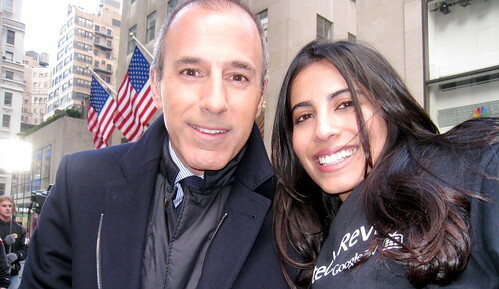 Matt Lauer and Praneet Kailey pose for a photo after a great conversation about the Logitech Revue with Google TV! A Meredith Vieira fan with Meredith wearing his Logitech Revue search bar: What’s on? T-Shirt… he wrote Meredith on his with one of our Sharpies! How appropriate! Meredith and Praneet discuss Logitech Revue w/ Google TV…this is a still taken from a video clip: coming soon! The cameras pans over some of our crew. 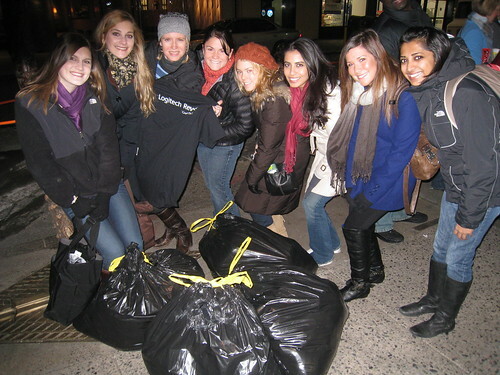 Praneet Kailey with the lovely ladies of Ruder Finn PR. NYC citizens loving the giveaways!